Orchard Cottage is a dog friendly cottage in Mid Wales. 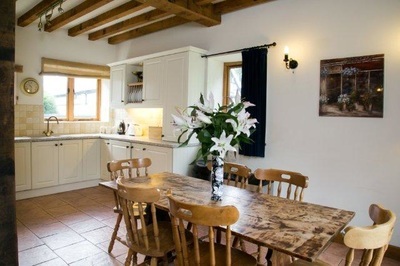 The holiday cottage sleeps up to 7 people in 3 Bedrooms. 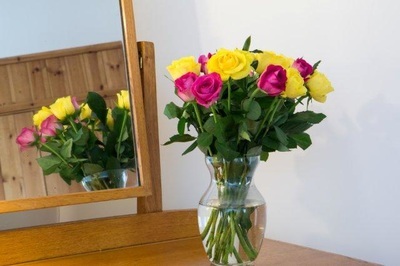 There are 2 double bedrooms (1 ensuite) and one flexible rooms which can be used as king/twin. All are located on the first floor. One of the doubles can accomodate an extra bed. All of our additional folding beds are premium hotel standard with deep,spring interior mattresses designed for regular use. The open plan kitchen/dining area has access onto a private balcony, overlooking the trout pond and beautiful gardens that adorn Highgate Holiday cottages and over look the beautiful Mid Wales countryside and Highgate Valley. To the rear of the cottages is the delightful mill pond, which provides a wonderful vista from the private balcony terraces of the barns. The pond is stocked with trout and attracts an abundance of wildlife, including otters, throughout the year, whilst red kites are often seen circling overhead. 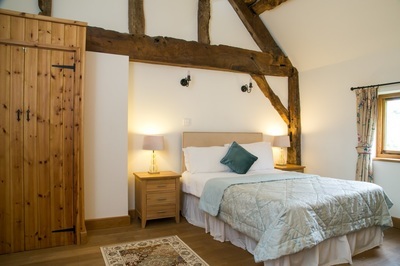 Both cottages are converted from a 19th Century Mill Barn and stands within the ground of Highgate House. Highgate house dates back to 1631 and is a prominent Grade II listed house of immense character. The cottage is located just a mile from the village of Bettws Cedewain, which offers a fantastic local pub with great food, and the market town of Newtown is just 3 miles away. Highgate cottages is the perfect location for that short break or family holiday. ​For those that would like to try a spot of fishing whilst on the holiday, the pond is fully licensed so feel free to bring your fishing rod! ​Cottages can be booked together for larger parties. A graveled parking area provides ample parking for these properties.